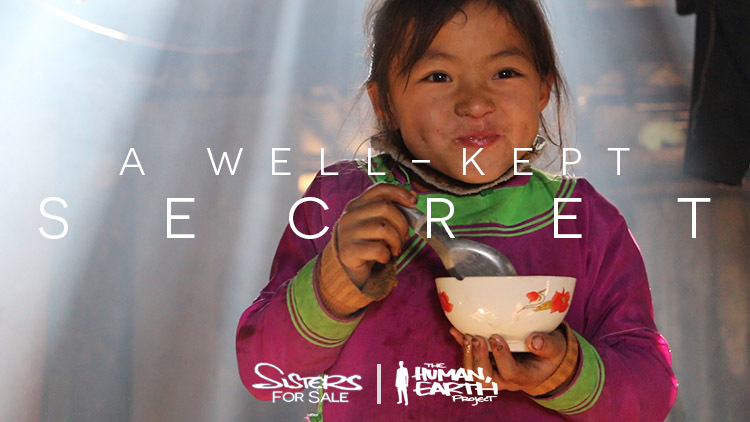 It’s an exciting time for ‘The Human, Earth Project’ – we’re approaching a huge milestone with the release of our feature documentary, ‘Sisters For Sale’, and today I’ll be raising the curtains on where our journey will be leading us beyond the film! ‘Sisters For Sale’ will give a powerful and very personal glimpse into the global human trafficking crisis. It’s now four years since I began planning the film. It’s three years since we were filming in Vietnam and China, and two years since editing began. I keep a tally of the hours I work each day. This month, with the editing of the film approaching completion, my work hours will be literally off the charts. I describe ‘Sisters For Sale’ as a “feature film” – but what does that mean, exactly? Technically, it could be anything over 40 minutes. To an audience, it often means 90 minutes or more. This is the length many feature documentaries aspire to – and many seem stretched to fit that length. ‘Sisters For Sale’ is a complex story, and I wanted to tell properly. I imagined the final running time would be around 100 minutes – but it has grown beyond that, and now stands at just on two hours. While that might sound like a lot to you, it still seems barely enough to me, knowing how much great material I had to work with, and how many gems I’ve left on the cutting room floor. I haven’t had a day off in weeks, and haven’t been sleeping nearly as much as I should have. Yesterday, while exporting a copy of the film, I left the house for the first time in 11 days. When I came home, I poured myself a glass of wine, and sat down to watch it. I’ve been looking at this film every day for months. I can’t tell you how many times I’ve seen it – but this was the first time I’ve sat down to watch a full version from beginning to end. Like many creative people, I’m very critical of my own work. It’s a mindset that means you’re rarely, if ever, satisfied – so it keeps pushing you to improve your game, to make your work the best it can possibly be. I watch a lot of documentaries, and keep a list of my favourite documentaries of all time (there are currently 49 of them). These films represent more than just fascinating true stories – each contains powerful ideas that have changed the way I see the world. My aim, in producing ‘Sisters For Sale’, has been to make a film worthy of inclusion on that list. Well, I’m a little biased, of course – but yes, it is. And it will be even better in September, when the music and animations have been added, the colours have been corrected, and the sound has been mixed. It’s not quite the final cut – there are still some tweaks to be made – but it’s getting very close. I want to send out a huge THANK YOU to all of you who have helped make this possible – and especially to Tracey Smith, for her amazing support over these past weeks (and years)! Everything ‘The Human, Earth Project’ has achieved has been thanks to the support of individuals from all around the world. One of the wonderful things about having an organisation that relies on the support of individuals is they can take it in some truly unexpected directions. In the past year, amongst other things, our work has been supported by a full-day yoga event, a trivia night, and the sale of Xmas puddings. My good friend Ben Guilding and his friend Kaan Hills have just completed an epic 10-day, 1,300-kilometre return journey from their English hometown of Swindon to Amsterdam – on a 90-year old tandem bicycle. Ben wanted to use their ride to raise money for ‘Sisters For Sale’. I thanked him, but told him ‘Sisters For Sale’ was already funded last year – at least, the documentary was. It’s been a well-kept secret, but for the past six months, ‘Sisters For Sale’ has been more than just a documentary. Remember all those gems I left on the cutting-room floor? By compressing a five-year story into a two-hour film, I was forced to cut many fascinating facets of the story. I felt it was important material that should be made public, but didn’t know how – and then Claire came along. Claire produces TV and radio documentaries with the BBC. She was impressed by the 40-minute ‘Sisters For Sale’ teaser I’d released last year, and wanted to work with me on the story. Claire is now producing a 10-episode podcast on ‘Sisters For Sale’, which will be made available after the release of the documentary. The podcast will use a serialised, audio-only format to give a more thorough exploration of the story. Where the documentary skims the surface, the podcast will dive right in. I’m excited to hear it myself, and will be sharing more details over the coming months. Ben and Kaan’s epic ride has now raised over $500 to help Claire bring this story to the world, which is amazing – thank you! It’s no longer possible to get your name in the credits of ‘Sisters For Sale’ – the final list has now been compiled, and that option has been removed from our website. Some people have had issues pre-ordering the documentary, so I’ve kept that option open for now. This is still the only guaranteed way to see the film – if you’d like to pre-order ‘Sisters For Sale’ and haven’t yet, you can do so here. If you’ve contributed lately, you should have received an email response from me – if you didn’t, please let me know!